Last year about this time I joined the “Cincinnati Birders Meetup Group“, a community based group of like minded people who use the internet to create a web page where activities and outings are promoted and conducted. Pictures can be downloaded, and topics can be discussed through a conventional message board. The group I joined has has all different skill levels in regards to birding, so it’s fun to see new people see their first life bird, or to share birding experiences. Unfortunately the organizer of our group was attending grad school and was a single mother on top of it all, so she had to quit the group leaving doubt as to whether the group would exist or not. They needed an organizer and I didn’t feel like taking on the job. Even though the group was a lot of fun and there were some great people involved, I don’t necessarily need a “group” to go birding. So I left the group and never gave it another thought till last weekend when I meet Gene Dennis. We birded together with the group prior to me leaving, so it came as a surprise that the group was resurrected, and now has multiple organizers. So he invited me back, and yesterday was my first trip with the group since my return. The individual who organized the trip is also from Maineville, my home town, and we were going to Cowan Lake State Park for some morning birding. We were to meet at the beach parking lot at 9:00 am, and with the rain we had early in the morning it came as no surprise to see that the expected 13 people who signed up was reduced by half. Which is OK by me. Sometimes when you have a larger group it’s difficult to hear the birds. The goal for the day was to drive to multiple locations and scope out the lake as much as possible from the limited amount of vantage points you have when driving a car. So naturally we started at the beach on the southern edge of the lake and worked our way towards the east where the park has boat slips set up. And at this location, which I think is one of the best, the lake gets shallower, with more cover for ducks to hide in. 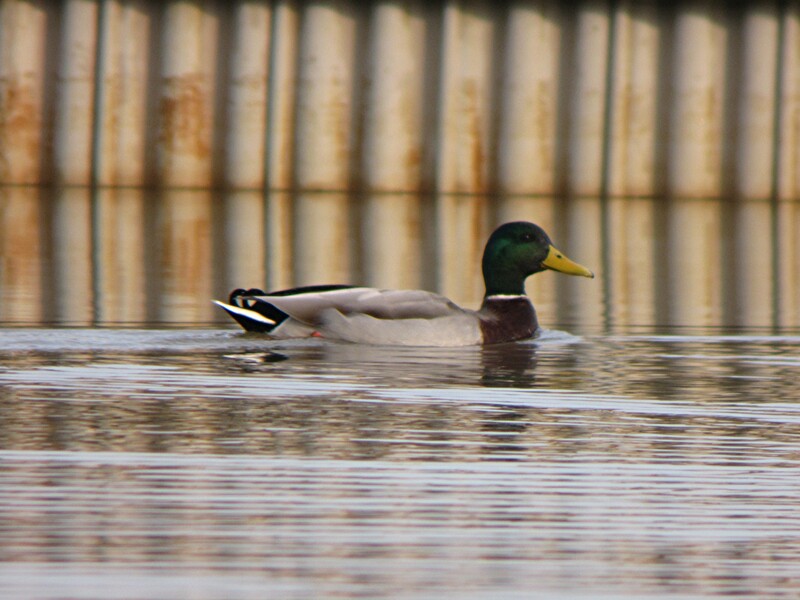 This year Cowan Lake had the best waterfowl activity in the area overall during the course of the winter. Usually Caesar Creek is better, but not this year. Now one might say that the Mallard was the dominate species on the lake yesterday. And I would have to agree, however Lesser Scaup and Ruddy Ducks would probably come in a close 2nd and 3rd. The rest of the day was spent driving from location to location all around the lake region adding birds to the total day count. And as we traveled together we really started to get along as friends would, with a common bond of birding. Now don’t get this wrong, I’m not devoting my entire free time birding with my Meetup Group, (which isn’t a bad idea) however since this is more of a local group, and we all know how much a like taking road trips, this group might not go along for such ideas except a few. So for now we’ll keep it simple and go on an occasional field trip with them and participate as much as I can. The problem I find when trying to take a picture of any waterfowl that likes to dive is trying to get a focused picture while the bird is surfaced. 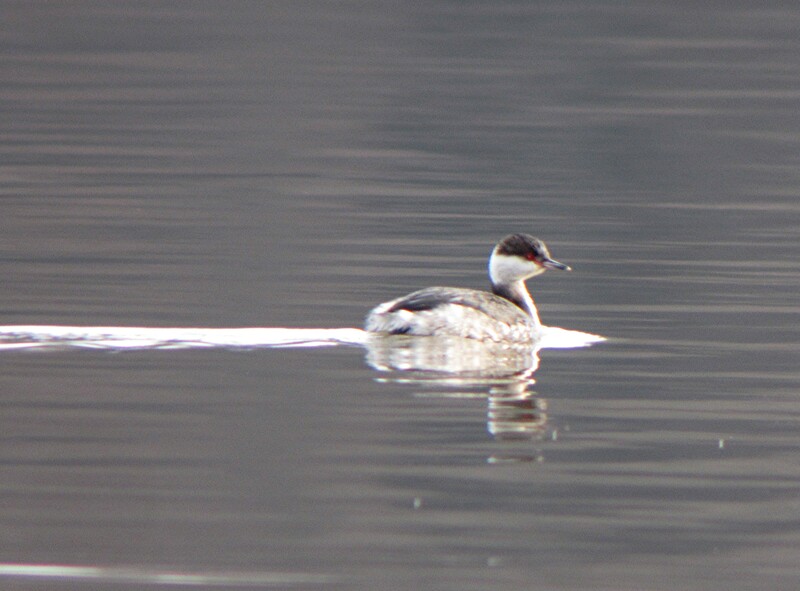 It may be blurry but we know that it’s a Horned Grebe. We ended the day with a nice muddy hike through the woods to a place which offers some great views to shallow east end of the lake. Where the ducks like to hang out. As you enter the woods you’re greeted with the song of the Eastern Towhee, Northern Cardinal, and with glimpses of Kinglets and Butter-Butts. Even with our small group we were able to spook a majority of the Northern Pintails, and both Teal species. A fly-by of a mature Bald Eagle made the day complete. 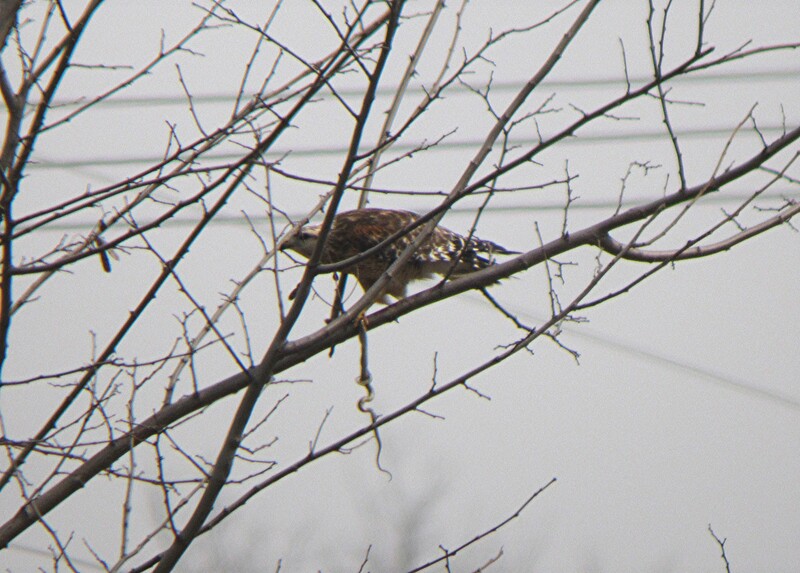 You know when Spring is in the air when the Red-shouldered Hawks start to eat snakes. So will I make the next outing organized by my Meetup Group? Probably not, since it’s at the Cincinnati Nature Center, and if you’re not a member it’s $8.00 dollars to get in. I know a thousand places where it’s free and probably take advantage of those before I drop 8 bucks. However this trip to Cowan Lake was a new start, with new friends, with a new group, with the new leadership that I hope helps the group grow. As I set out from the house at 9:00 am this morning with light snow flurries blowing I recalled the last time I went birding. It’s bee 2 weeks since I set bins to eyes and it was about time I went out. But first things first, the bird mobile had to have an oil change. This was kind of like your child’s first haircut, except this time it was my brand new car getting it’s first oil change. So as I left it in the hands of competent mechanics I strolled the Loveland Bike Trail and did some early birding while I waited. It was a cold morning and only a few birds were kicked up during my 30 minute walk, so it was back to the garage, paying the mechanic, then the long driver towards Wilmington. My first stop was to be the one small lake just on the other side of Wilmington which held so many waterfowl that one time. I was hoping that the ice had melted and opened up the water. But before I headed north to Wilmington I make a quick stop at Lake Isabella to see if the Great Horned Owl was still in it’s nesting can like years past. 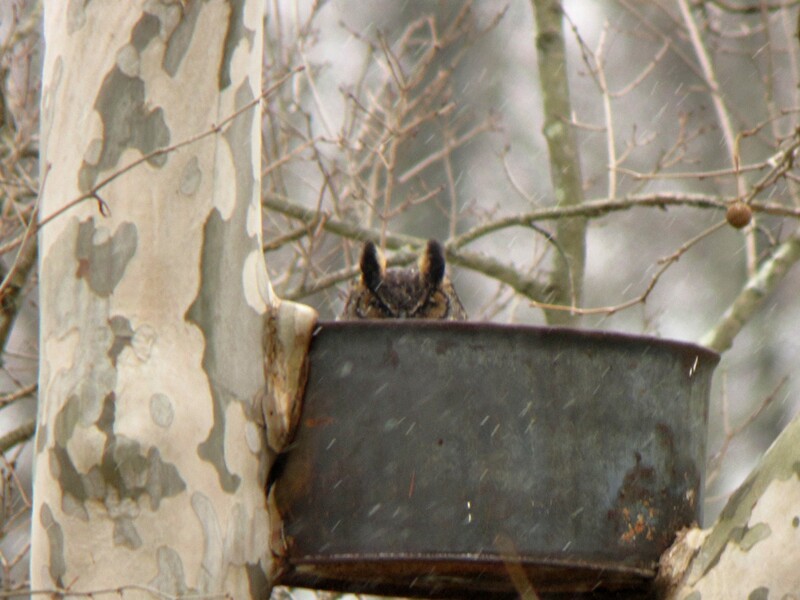 This is one spot where you can almost always rely on a Great Horned Owl to be this time of year, and this year was no different. And this is how I usually see it, just the top of it’s head. Since I was here I made my way over to the lake where scores of fisherman were and scanned the lake. 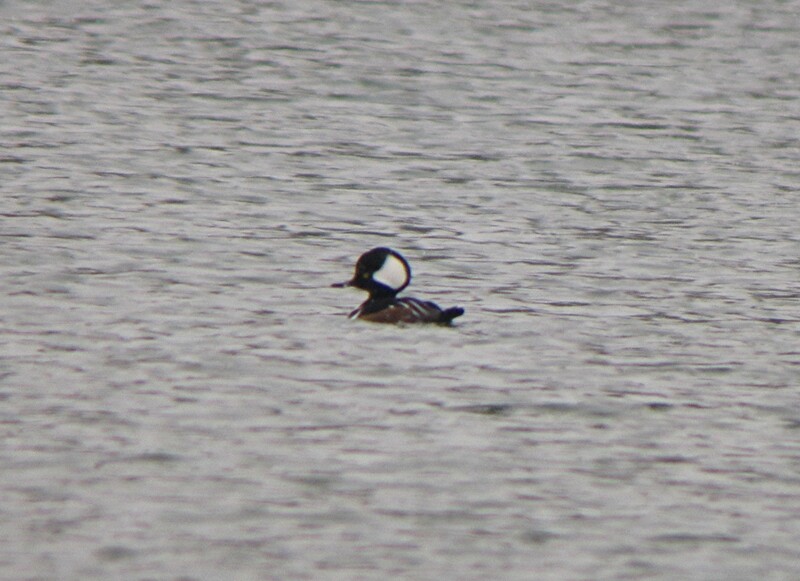 Hooded Mergansers were all I saw. 45 minutes later I pulled into the miniature golf course and wasn’t at all pleased with what I saw. Practically nothing. A few Coots and Mallards was all I found. Well the day was young and Caesar Creek was just down the road. This winter Caesar Creek has been pretty devoid of good waterfowl and now that migration was starting to reverse itself I was hoping that my luck would improve. My first stop was to be the boat ramp at the campground. 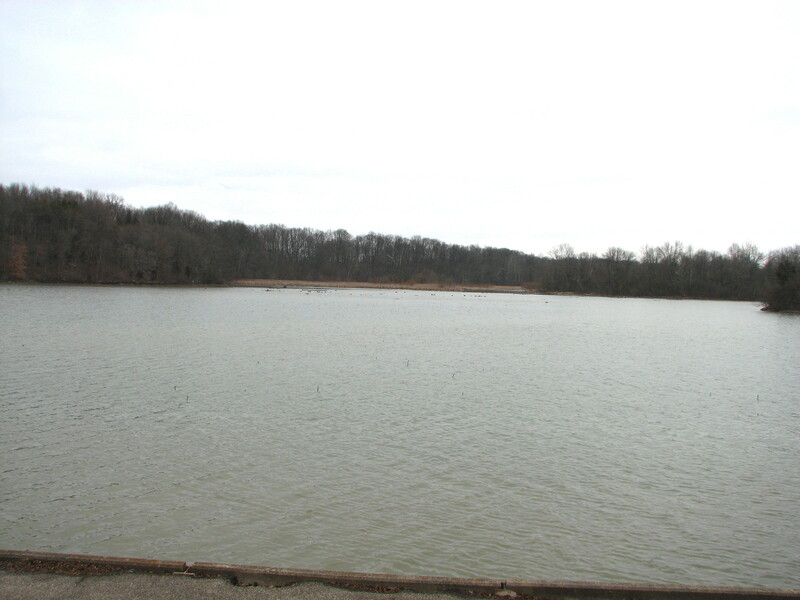 From this vantage point a large section of the northern portion of the lake. With the campgrounds closed for the season there was no one in sight as I drove through to the boat ramp right up to the waters edge. As I pulled up I noticed just one small black dot floating on the water directly out from where I was standing. 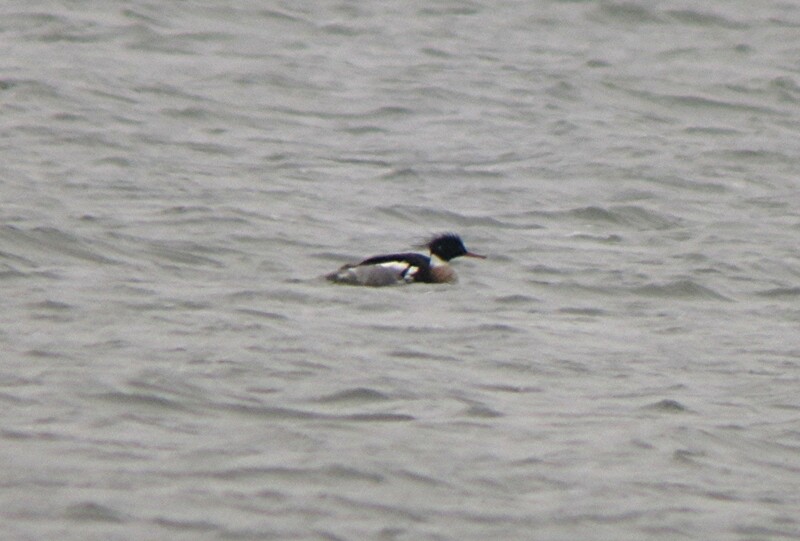 Leveling my spotting scope on it, it turns out to be a lone Red-breasted Merganser. After leaving the camp grounds I wanted to make my way to the parking lot that the park made at the end of Ward Road. The parking lot has a trail head where after about a 10 minute hike you’re on a bluff overlooking the lake with some spectacular views. The walk in was uneventful with hardly any bird activity to speak of, however I was hoping to see more when I reached this one point on the trail that had the best view. As the trail climbed, so did the wind. By the time I reached where I wanted to be the wind was howling making an already cold day even colder. Then to top it off no birds except a few Canada Geese on the down wind side of an island. Well it was a nice hike all the same, as I started my way back to the bird mobile. Spring Valley was about a 20 minutes drive away so I made my way over there to see if my luck would change. As I made my way over to Spring Valley I came to the realization that I’ve done more driving than birding. Most of the big lakes just didn’t have anything on them, which in turn made for a short visits. Stop-n-go, in and out, extend then collapse the legs on the tripod, that’s all I’ve been doing. And Spring Valley was no better when it came to birds, hardly anything. It was already after 1:00 pm and I was hungry, and with Waynesville right on the way I made a quick pit stop to re-fuel myself before I let out one last time to Cowan Lake, my last stop for the day. After picking up some lunch I was making my way towards Cowan Lake when I passed this old corn field and noticed several large dark shapes foraging in the field. Wild Turkeys. Wild Turkeys are very common in this part of the state so spotting them was no surprise, however I got this wild hair where I wanted to try for a picture. It just so happens there was a turn off where this abandoned out building sat next to the field where the Turkeys were feeding. They sensed my presence and started to move further away. I stayed low as I got out of the car and went around back to open the hatch to retrieve my scope and camera. 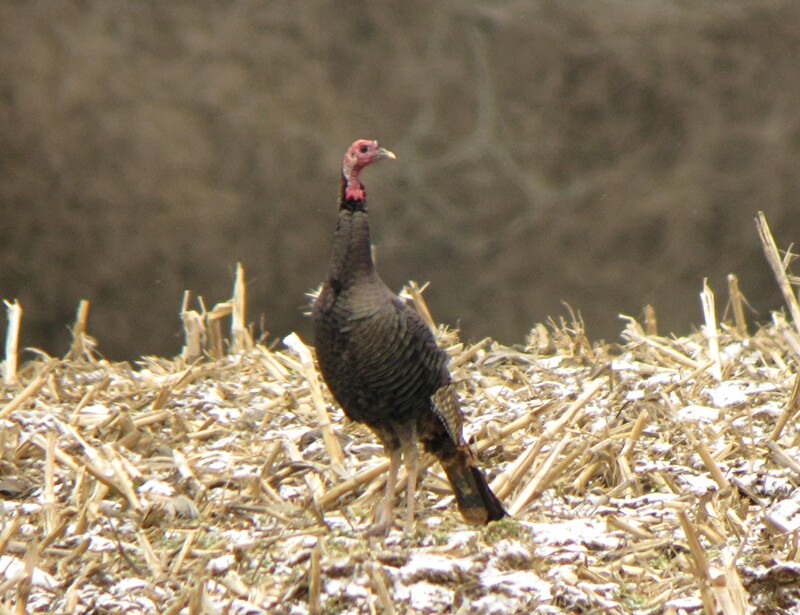 Even though I got several shots off, most of them were blurry from them moving, however I did manage to snap of this one of a Tom who seemed to be keeping an eye on me, just to make sure I wasn’t a threat to his girls. The drive to Cowan Lake was another long one and with the recent sightings of some decent ducks, hopefully I can spend some quality time actually birding. I like Cowan Lake because it’s not too big and with a good spotting scope you have the ability to see across without too much trouble. There is one area by the lake where you can park and walk right to the edge and this was where I was heading. Much to my delight as I pulled over and got out of the car was the sight of ducks. Lots of them. Why didn’t I come here first. I slowly made my way towards the far end of the lake where it gets shallow and winds it’s way back into a marshy area. Hundreds of ducks and geese were packed into this area. I know you can’t see it on this picture, but take my word for it, they were there. The rest of my visit was spent here going back and forth with my spotting scope making sure I saw everything that floated. It was a good day despite the cold and wind. Have you ever gone to work on your day off? It happened to me on the Monday that followed our trip to Hilton Head back in October. Well history almost repeated itself, as I forgot that I had taken today and tomorrow off . I had asked for the days off late last year when Kathy and I were planning a short trip to Atlanta for a medical conference that Kathy was going to attend. Well she decided not to go, and I forgot that I asked for the days off. So it came as a surprise when at work yesterday when the charge nurse reminded me that I had a long weekend. SWEET! Let’s go birding. But first let’s sleep in a little and have that second cup of coffee while lounging around in your soft clothes. Then, when I feel motivated enough, I’ll hit the road. I arrived at Cowan Lake a little after 9 am with hopes of re-locating the Eurasian Wigeon that eluded me the last time. My plan was to cover along the Southern edge of the lake from the large picnic pavilion Eastward towards the boat ramp and docks. There were just a few fisherman out and the water was glass smooth upon arrival. With my initial scan I could tell we had some good waterfowl out on the lake. Today could be my lucky day. Driving back and forth along the lake front I would stop, take my scope out and see what I could see. Male Hooded Merganser and his lady friend. On one of my loops around I noticed a kettle of Turkey Vultures sunning in a tree by the side of the road. The one that caught my attention was the one with it’s wings out. I would have loved to have gotten a picture from the front, however I’m sure they would have flown off as soon as I got out of my car. I had been there for about an hour when skies started to darken and the sound of thunder off in the distance was barely heard. My plans to hike back on Locust Trail to where so many good ducks were was not going to happen. The last place I wanted to get caught in, would be in the middle of the woods in a thunder storm. However there was one more spot I wanted to check out before I left, which offers a good view from a bluff of this small bay near the large picnic pavilion. While scanning the lake from the bluff I noticed what I thought was a Pied-billed Grebe. So I took a picture of it, and when I got home blew it up, I looked closely at it, and it turned out to be a Horned Grebe. The red eye was the first clue for a Horned Grebe. But look at the throat, it’s starting to turn reddish with it’s Spring mating coloration. I thought that was pretty cool. I left the park about 10:30, and it’s a good thing I did. I was just a couple of miles away when the heavens opened up. Still no Eurasian Wigeon. 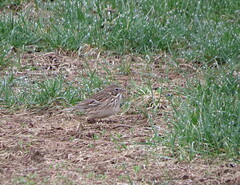 For me this is the second time I’ve chased this bird. The first time was at Fernald Preserve earlier in the fall with the help of the site manager allowing Shane Eggleston and myself the opportunity to drive to an “off limits” spot where we were able to get good views of the Wigeon. Today was different. The first few stops were the beach and then the boat ramp in the Eastern portion of the lake. From here you’re allowed a free view of the shallow end of the lake and where the Wigeon was first viewed. From what I could make out it was mostly Teal, Shovelers, and Coots. I needed to get across this portion of the lake to get a better view into the shallower end, so back into the bird-mobile for the drive over. This part of the lake is probably the hardest to access, however there is one trail called the Locust Trail that will get you as close as any other place. That was my next stop, after I pulled over and did a quick ID on a raft of Ruddy Ducks. The trail was muddy for the 20 minute hike to the lake. Eastern Towhees greeted me as I stepped under the canopy of branches just starting to swell from buds aching to burst open. I was alone, and I loved it. It gives you the feeling that everything around you is all yours. For your eyes only. 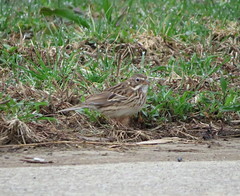 That’s until you run into other birders chasing the same bird as you are. I stayed at the overlook off of Locust Trail for about an hour with no sign of the Eurasian Wigeon. Feeling the need to move to another location, I went hiking back to the parking lot and try my luck at another spot. 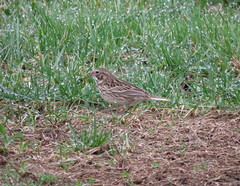 The morning was waning and I didn’t have a lot of time to bird this morning. David was home for Spring break and he was leaving today after we had lunch and I wanted to get home and see him off. I drove over to the campground where they have a boat ramp which offers some panoramic views. For the most part the people fishing scared off most of the ducks out of the middle of the lake, except this lone Common Loon. There he was, right out in the middle of the lake, totally oblivious to the coming and goings of the fishing boats. I left the boat ramp and made my way over to the cottages that the state rents out. Some of them sit very close to the edge of a bluff overlooking the lake. Setting up my scope and scanning for several minutes, I struck out again. Or did I. Even dipping on the Eurasian Wigeon doesn’t really matter when you can be out on a beautiful day like today birding.